One of the magical qualities about music is that it’s a universal language that knows no boundaries. Roisin Adams and Sina Ettehad grew up worlds apart – in North Vancouver and Tehran, Iran, respectively. While Ettehad was first introduced to music through the classical violin at 12 years old, with Adams it was the piano when she was five. As he developed his musical talent Ettehad as a teenager became enamoured with the ancient Iranian fiddle known as the kamancheh, and has devoted most of his life pursuing and honouring that tradition. “I became really fascinated with the sound,” says Ettehad, describing the bowed instrument as having the ability to produce a velvet warm sound or an emotional aggressive sound, depending on the pitch. Adams, meanwhile, gained a good theoretical understanding of music during her formative years which set her up to become a masterful composer and improviser of jazz music. Musical worlds and culture collided harmoniously a couple years ago when Ettehad and Adams crossed paths at Vancouver Community College where they studied music together and constantly brought up the idea of collaborating together. “We share a mutual respect for the music we play and we also share the same affinity for improvisation among other contemporary musical practices,” explains Adams, of the impetus behind their upcoming concert in West Vancouver. On Thursday, Dec. 17, the audience at the Kay Meek Centre will experience Fusik: Worldly Approaches to Improvisation – a spontaneous evening of folk-bending, culture-blending music. 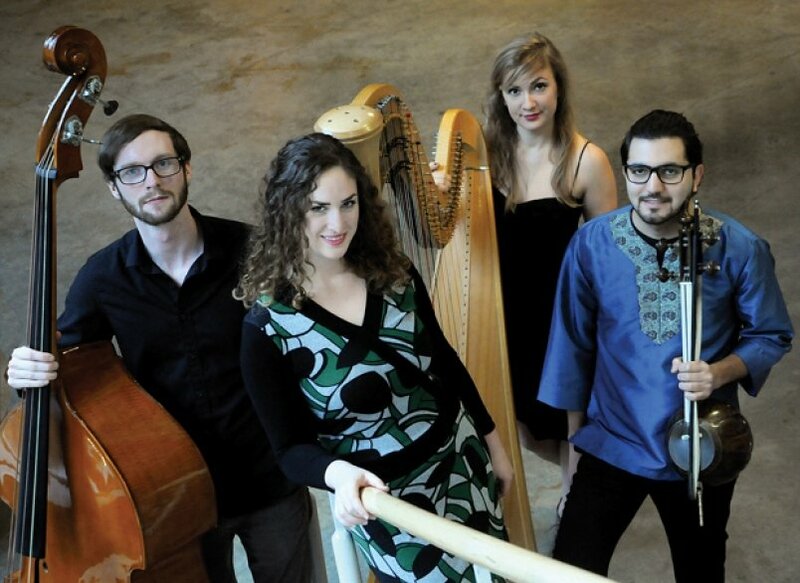 Adams’ jazz quartet Hildegard’s Ghost will start the evening in the Euro-American tradition with a marriage of electro-acoustic compositions and improvisations, featuring Elisa Thorn playing the harp, Justin Devries on drums, Jeff Gammon, double bass, and Adams at the piano. Hildegard’s material is always fresh, thanks to the improvisational element, but the quartet will be drawing some favorites from their latest album, Stories. “We will be sure to sneak some songs popularized by the Dave Brubeck Quartet in our repertoire, as they are known for fusing traditional European forms with African-American music,” says Adams. The audience will then be transported to another world where they will consume a fusion of traditional Iranian and Hindustani music, mysticism and poetry improvised by Ettehad on the kamancheh and accompanied by Amarjeet Singh, who will be playing the Indian tablas, a pair of hand drums contrasting in size and timbre. Ettehad explains how the ancient Persian music system contains a collection of modes and melodies more than 2,000 years old that carries all the emotions ranging from sadness and happiness from generation to generation orally. Improvisation became the keystone of the Fusik concert, explains Adams, to showcase its prevalence in the many cultures represented. “No matter what someone is reading from or what they are playing, sound communicates,” she says. Adams is effusive with her praise for Ettehad and Singh’s musical style. Ettehad is equally appreciative of Hildegard’s Ghost, saying he’s observed the way jazz musicians approach to improvisation is totally different than the way he’s been trained in Persian modal music, yet he could see some similarities. “I feel there is a common music sense between Hildegard’s Ghost and my music,” says Ettehad. Hildegard’s Ghost describes their musical style as “existing in the realm of the unusual, collecting and disseminating curious sounds at a moment’s notice.” The musicians test the limits of their instruments and imagination but never lose connection with the heart of the music. “In true form we will be playing something new (an original by Adams) and something old (traditional tune) with a unique twist,” says Adams of what the audience can expect for the grand finale. Ettehad, who now lives in North Vancouver, is a core member of Kereshmeh Ensemble, one of the world’s leading Persian classical music ensembles, an active member of the Vancouver Inter-cultural Orchestra, and teaches the kamancheh at the Nava Art Centre. Hildegard’s Ghost, meanwhile, is brewing up a batch of new tunes as they prepare to return to the Silk Purse Arts Centre next year for their 2016 Jazz Waves Series on June 9. For more information visit hildegardsghost.com.